Over the course of the last six years as I have built my Newark memorabilia collection I have seldom purchased receipts, invoices or letterhead unless they pertained to a well known Newark company or the graphics were highly decorative. The receipt pictured in this blog certainly won’t win any prizes in the graphics category but for well known Newark companies it doesn’t get much better. On this invoice we have not one, but two companies that achieved world renown . T.P. Howell, a producer of finished leather products and J. Wiss, a maker of cutlery. In Newark’s industrial heyday, the city not only manufactured all manner of finished goods, but also made the equipment that was used in the manufacturing! As this receipt plainly illustrates, these various enterprises could buy whatever they needed without leaving Newark. J. Wiss & Sons Company was founded in 1848 by Jacob Wiss, a thirty-one year old immigrant from Switzerland who was an experienced cutler and gunsmith. Initially located at 7 Bank Street they quickly out grew that location. 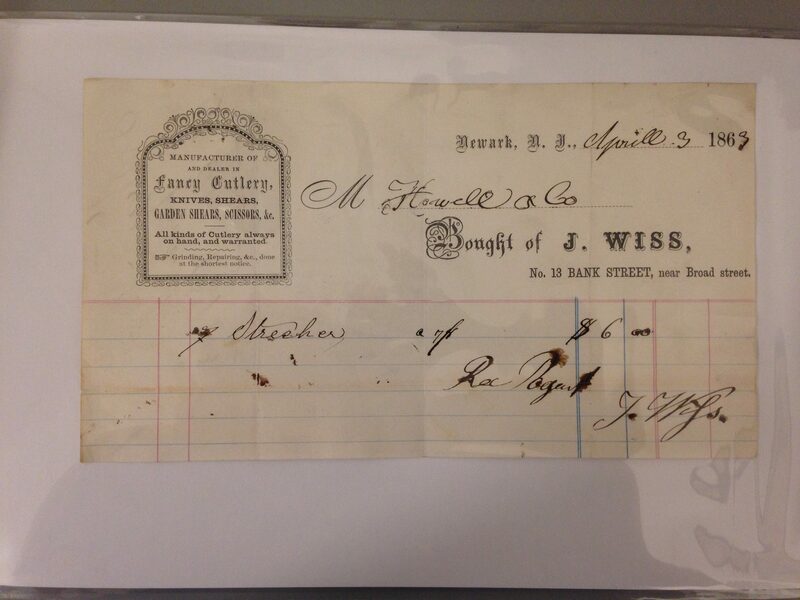 In 1854 , Wiss relocated to 13 Bank Street ( the address on the featured invoice). Their final location downtown was 26 Bank Street. In 1887, the company moved ” up the hill” to Littleton Avenue , where they remained until they were bought out and the factory closed in the late 1970’s. 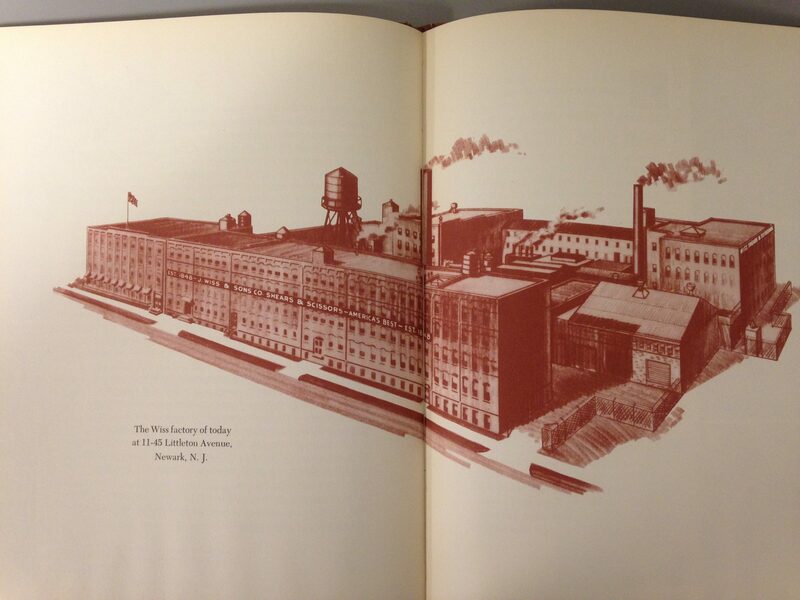 The company, which was headed by Wiss and his descendants in Newark, N.J. emphasized high quality in its products, which gained them a world-wide clientel. They sold their product to the U.S. Government during the Civil War and the two World Wars. In 1914, Wiss acquired the manufacturing facilities of their long standing competitor, R. Heinisch Sons Company and became the largest producer of scissors and shears in the world. Following World War I, Wiss weathered a severe depression in the scissors markets, partly caused by the dumping of European products. The Tariff of 1923 remedied this situation. I was curious – how could a cutlery company could make a significant contribution to the war effort? 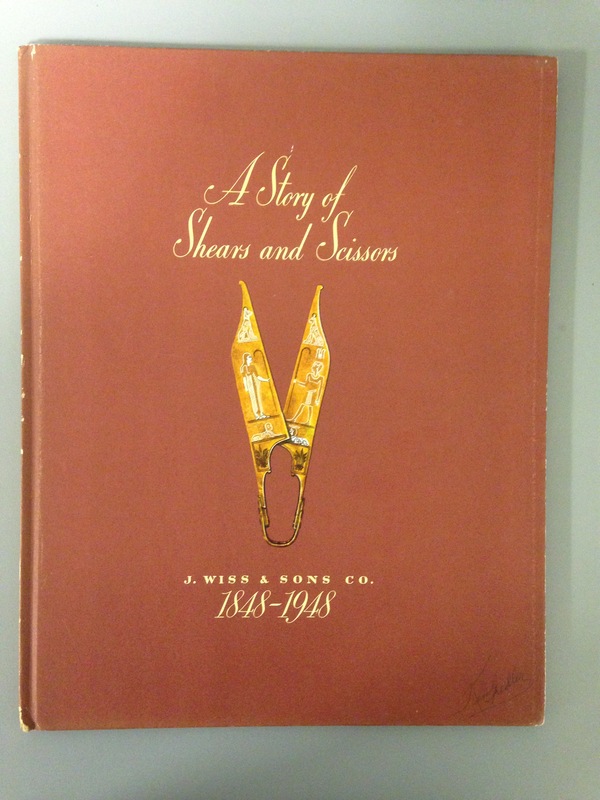 The following is an excerpt from: “A Story of Shears and Scissors J. Wiss & Sons 1848-1948”, clearly illustrates Wiss’ important role. “During World War II, the shortage of high­ grade steel and the enormous demand for Wiss products by the Government and war industries made it difficult to apportion satisfactorily the few scissors and shears left over for the public. Wiss snips played their part in the manufacture of tanks; shears in the making of uniforms and protective coverings. Pinking shears were used in the manufacture of airplanes. Cuticle scissors were used in the making of radar and radio equipment, as were nail scissors, which, in addition, were often used for bartering with natives in remote parts of the world where the value of American money was not as readily apparent. Curved-blade snips were used in the shipyards; even pruning shears were used for the preparation of poultry for overseas shipment. All kinds of surgical scissors bearing the Wiss name were also much in demand”. Once the war was won and wartime restrictions were lifted Wiss was ready to get back to the civilian market. The book ended on this optimistic note: “The outlook for Wiss-labeled goods at the threshold of a second century is bright. So long as free enterprise survives in a world of free people, J. Wiss & Sons Co. expects to continue to make the finest quality shears and scissors and sell them all over the world “. Alas, Wiss was only to last another twenty eight years . Cooper Industries purchased the company on December 1, 1976. After the purchase, the factory remained in Newark until the Spring of 1978 when most operations were moved south. The forge stayed in Newark a while longer. Eventually, the manufacturing was moved overseas. Only the name survives completely shorn from its roots. For more information on J. Wiss and Sons visit the website of Don Wiss- jwissandsons.com. T.P. Howell and Company, founded by Theodore Pike Howell, was located at the intersection of Wilsey and New Streets in Newark, NJ. The company manufactured patent and enameled leather. the company success was due in no small part to their willingness to embrace the latest technologies in the making of their product. In time they became one of the largest operations of its kind in the world. Their products were exported to Europe, and even parts of South America and the West Indies. In addition to his success in the leather manufacturing business, Howell was active in many other Newark businesses, including memberships on the boards of the Mutual Benfit Life Insurance Company and the Howard Savings Bank. In 1856, he was the unsuccessful candidate for Mayor of Newark, New Jersey, for the then newly formed Republican party. He was also a trustee of the Park Presbyterian Church in Newark, NJ. Nice receipt. I’ve never seen one so old. It appears to have Jacob’s signature. Could I get a 300 dpi scan for my jwissandsons.com website? My father worked at Wiss for 50 years. He loved it there. He retired in 1977 I think.